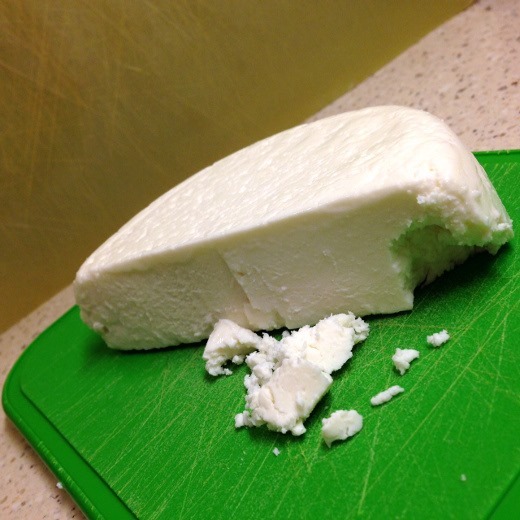 What is the best way to use up a block of Queso Fresco? 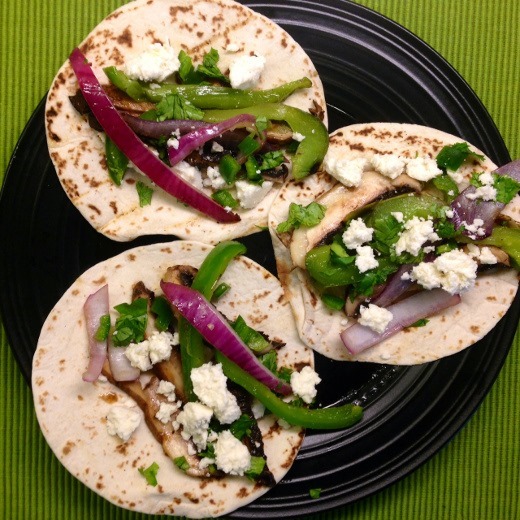 This was a question I recently had after I made Grilled Portobello Mushroom Tacos with Queso Fresco [shown below], and found myself with half of a block of the stuff. Queso Fresco is a mild and crumby Mexican cheese, somewhat similar to feta, but not as salty and briny, and it lends wonderful rich creaminess to dishes. It’s readily available in many supermarkets (such as Meijer in Ann Arbor). 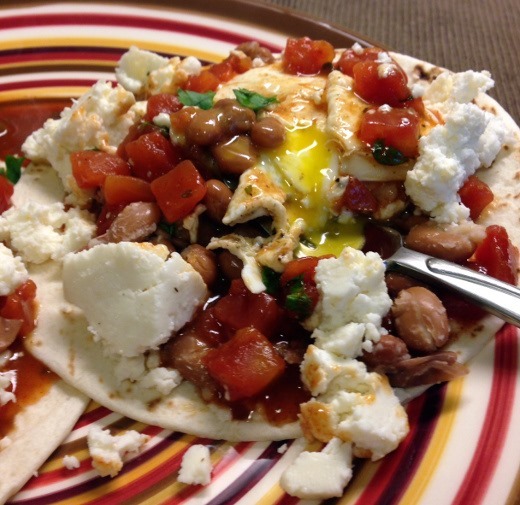 A quick search on my go-to recipe resource, the Cooking Light website, led me to Huevos Rancheros as a great way to use up some of that leftover Queso Fresco. I cannot attest to having any knowledge of the authenticity of Cooking Light’s recipe, but I can tell you it was delicious! If you’re looking for something easy on the budget and the waistline, that can be quickly whipped up for dinner any night, this is it! First, simply combine a can of red enchilada sauce and a can of Rotel (diced tomatoes tomatoes and green chilies) in a medium saucepan. I went for the hot version of Rotel, featuring diced tomatoes and habanero peppers. It was indeed hot and spicy! Go for the milder version if you prefer less heat. 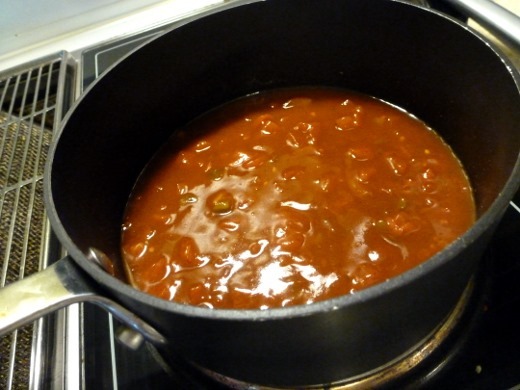 Simmer the enchilada sauce and Rotel mixture for about five minutes, until slightly reduced. 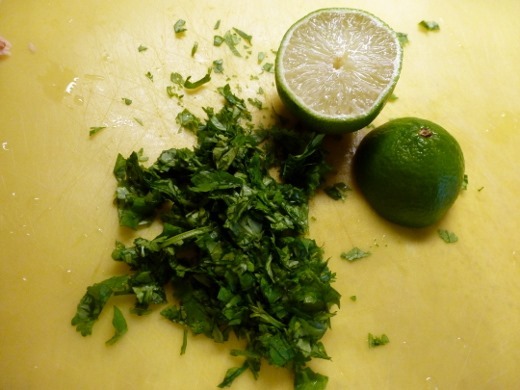 Remove the sauce from the heat and add minced cilantro and a squeeze of fresh lime juice. Next up (not pictured): warm partially mashed pinto beans, and flour tortillas, in the microwave. 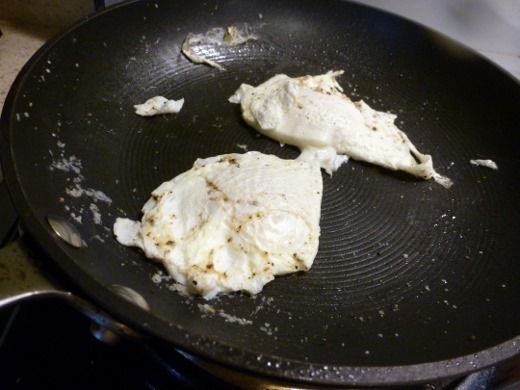 Finally, fry a few eggs in a skillet coated with cooking spray over medium-high heat. Can you believe that this was literally the first time I’ve made a fried egg!? I’ve always preferred scrambled, but have warmed up to fried eggs over the years. This is the first time I’ve fried one myself. I think you’d call this over-easy!? Yeah, I’m feeling like a total egg-amateur over here. Basically, just cook a couple eggs to your liking. I recommend two per person (I cut the original recipe in half to feed just me). sprinkle queso fresco over everything! Dig in! Check out that runny yolk. This dish is satisfying on many levels! 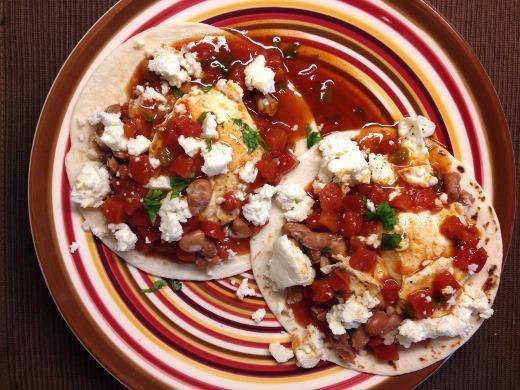 The tomatoes, fresh cilantro, and lime juice bring a bright fresh flavor to the dish, while the beans and egg add heartiness. The queso fresco lends a creamy saltiness that really takes the dish over the top. And how easy was this!? This recipe is not only a perfect way to “use up” queso fresco, but it is also perfect for a busy week night dinner! 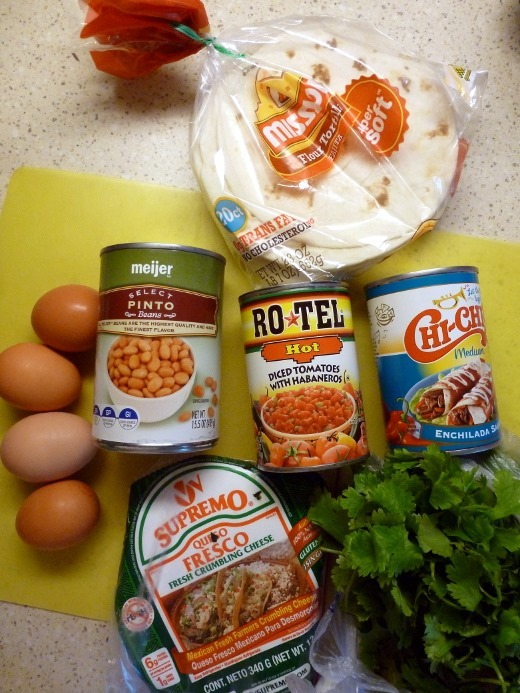 And you may even have many items already on hand, as I did (like canned beans, eggs, flour tortillas, and limes). Try it out for a new spin on dinner! 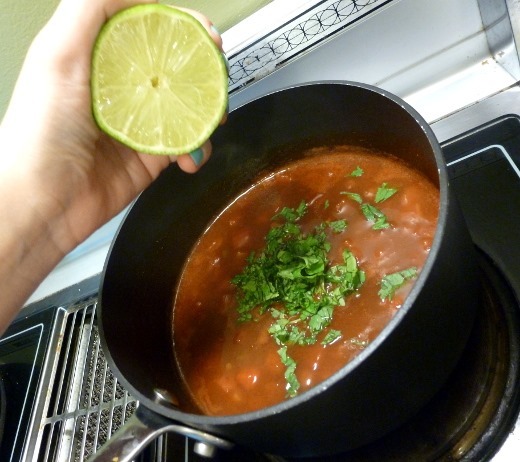 Combine the tomatoes and enchilada sauce in a medium saucepan; bring to a boil. Reduce heat; simmer 5 minutes or until slightly thick. Remove from heat; stir in cilantro and juice. Set aside. Place water and beans in a microwave-safe bowl, and partially mash with a fork. Cover and microwave at HIGH 2 minutes or until hot. Heat a large nonstick skillet coated with cooking spray over medium-high heat. Add eggs; cook 1 minute on each side or until desired degree of doneness. Warm tortillas according to package directions. 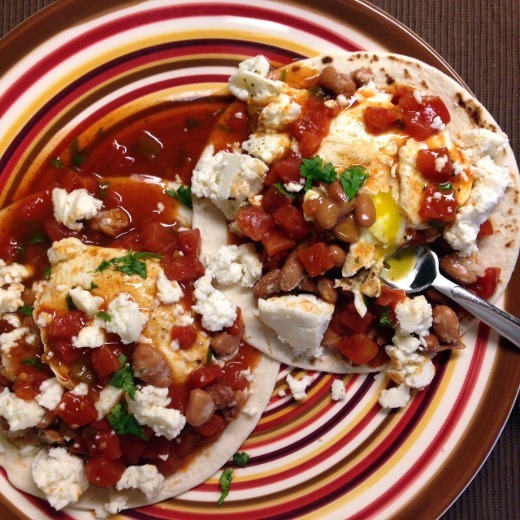 Spread about 1/3 cup beans over each tortilla; top each tortilla with 1 egg. Spoon 1/2 cup sauce around each egg; sprinkle each serving with 1/4 cup cheese.